At a time when cities across India are rapidly losing green cover, Naya Raipur, the administrative capital of Chhattisgarh, stands out in its endeavour to ensure that the city has adequate greenery. The Naya Raipur Development Authority (NRDA) was established with the aim of creating a greenfield city with parks, botanical garden and a jungle safari. Naya Raipur’s greening efforts aim to make it a model city with the target of 27% green cover under the Harihar Chhattisgarh mission. The 25-year development plan for the city envisions a 500-meter wide green belt of an area of 15.09 square kilometers surrounding the core area spanning 80.13 square kilometers. Conscious planning to ensure there is adequate tree cover is a salient feature of the city. The planning authorities have earmarked open spaces in its residential areas, with 30% land reserved as green in each residential sector. This will drastically help increase the green cover of the city through tree-planting drives. The green belt adds to the lung space of the city. The banks of all water bodies in the have been developed in a manner that they are lined with trees. The development plan sets a target of 2031 to achieve the above as Naya Raipur looks to grow as a green, smart city. What is happening in other cities? India is ranked tenth in the world in terms of percentage of forest area. With rapid urbanisation and development activities such as mining, the ambitious target of bringing 33% of the country under forest cover can only be attained by concerted focus on improvement of green cover. State of Forest Report 2017 released by the Forest Survey of India reveals that the forest cover of the country is 21.54% of the total geographical area showing a marginal increase from the assessment in 2015 at 21.34%. The bulk of the increase has come from the improvement in forest covers in three states, Andhra Pradesh, Karnataka and Kerala. Parts of the country have seen a decline in forest cover due to reasons such as use of cultivation and forest land for development purposes, encroachment of forest land, mining and felling. The increase in forest cover seen in certain regions can be attributed to increased plantation and protection activities, afforestation drives and successful agro-forestry practices. New Delhi‘s tree cover stood at 12.97% of the total area of the state as per the State of Forest Report 2017. Greening endeavors in the state have resulted in a 3. 4 sq. km increase in tree cover since the previous survey, despite programs and efforts such as the Plant a Million Trees Campaign and establishment of a tree helpline to report illegal felling of trees. A 2017 study led by the Center for Ecological Studies at Indian Institute of Science in Bengaluru has estimated that Mumbai has a total green cover that is less than 13% of the city’s area. Urban growth was found to be the highest in Mumbai among metropolitan cities with 94% of the city paved and concretised. Recognising the grave danger of climate change and ecological damage to the city as a result of development activity, citizens have come together to resist infrastructural work that will result in the felling of trees. The Save Aarey campaign is one such effort by the citizens. Bengaluru’s declining urban vegetation and tree cover has been documented by an IISc study that states that there may only be 14 lakh trees in Bengaluru as compared to the official figures quoted by the Bruhat Bengaluru Mahanagara Palike (BBMP) that is closer to 50 lakhs. The city has only one tree per seven persons while to reach the optimum tree cover of 33% it needs at least 1.15 trees per person. While the BBMP claims to have planted close to 1 lakh saplings last year, the claim is yet to be verified. The devastating effects of cyclone Vardah in December 2016 has seen the city lose a sizable chunk of its tree cover. A study commissioned by the Corporation of Chennai and conducted by the Care Earth Trust has revealed that Chennai’s tree cover is only 15% of the 426 sq.km total area of the city. The cyclone alone is said to have uprooted close to 1.5 lakh trees. The local body has proposed a greening strategy to recover from the effects of the cyclone through the planting of 10 lakh trees over the next five years to increase the share of tree cover of the city. Other Indian cities have seen also seen a decline in tree cover due to urban sprawl, with Kolkata’s tree cover going from 23.4% to 7.3% in the last 20 years. Ahmedabad has seen a decline from 46% to 24% in the same period. 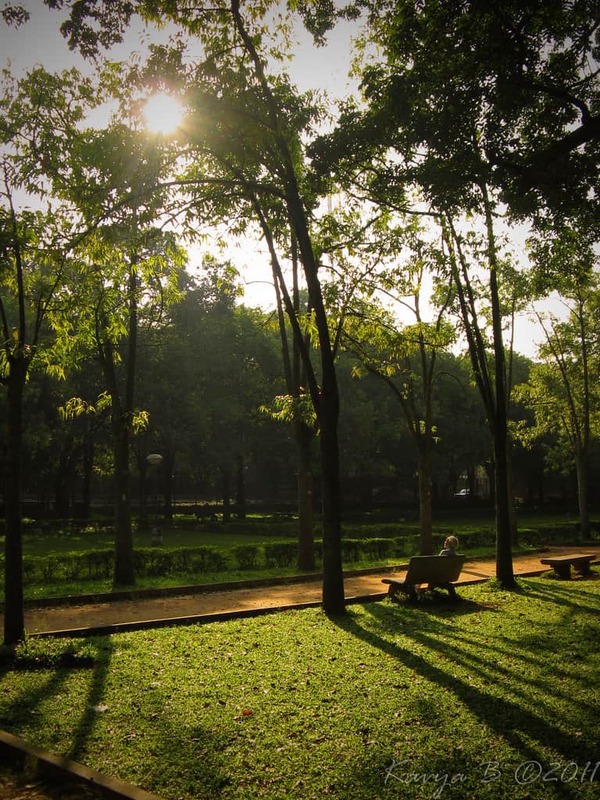 Hyderabad’s tree cover is a meagre 1.66% as per this IISc study. While various states have launched afforestation programs to varying degrees of success, urban forestry and tree cover in India’s major cities is a cause for concern. The central government’s plan to disburse funds collected from industries through the setting up of a Compensatory Afforestation Management Planning Authority (CAMPA) with a corpus of Rs 42,000 crores for the purpose of greening and increase in forest cover has hit administrative roadblocks as of April 2018, which could put a dampener on the various projects in the pipeline. 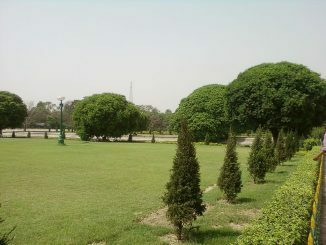 Naya Raipur’s lead in building a city around its vegetation and ensuring adequate lung space may be a distant dream for the already-concretised cities but concerted effort by the government and citizens to protect existing green spaces and create pockets of trees wherever possible is the need of the hour to ensure that the cities remain green.